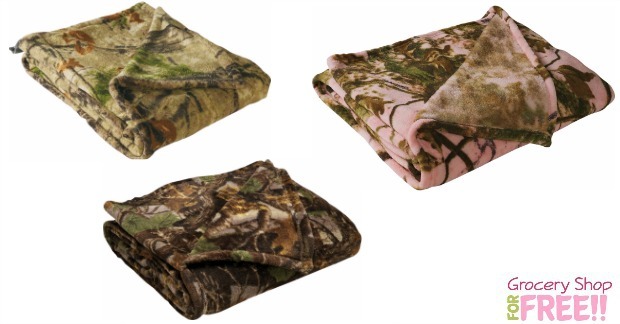 Cabela's Camouflage Coral-Fleece Throw Just $7.99 PLUS FREE Shipping! You are here: Home / Great Deals / Christmas Deals / Cabela’s Camouflage Coral-Fleece Throw Just $7.99 PLUS FREE Shipping! Cabela’s Camouflage Coral-Fleece Throw Just $7.99 PLUS FREE Shipping! Right now you can get a Cabela’s Camouflage Coral-Fleece Throw for just $7.99 PLUS FREE shipping! They are normally $19.99, but, right now they are on sale for just $7.99! The camouflage patterns and the warming softness of fleece make this throw a winner. Perfectly sized for versatile warmth as a blanket or for draping over the back of a chair, sofa or bed. 100% polyester coral fleece. Machine wash cold. Tumble dry low. Imported.